I think a lot of us know someone among our extended family and friends who's tried their hand at brewing their own beer. I know I do (waving at my brother-in-law, Todd). Trying it once or twice is much different from sticking with it past a few batches. Brewing beer is not for the faint of spirit. It is a long and not very simple process. If you'd like an overview of what's involved, start at byo.com/newbrew. I'm a beer consumer, and I do appreciate the process, but I knew long ago it was not something I wanted to try. But as technology advances, it eventually reached the homebrew market with a product I've been trying out called Pico ($799, picobrew.com). The Pico is a countertop appliance, not unlike a coffee maker, but don't just think you'll be popping in a pod and getting a cold beer to drink in a few minutes. Each batch of beer you brew will take at least a week to ferment and carbonate before you can drink it. Also, while we are introducing Pico, note it can be found on sale. And after a successful Kickstarter campaign, there is a slightly cheaper version called the Pico C coming in the fall. Brewing beer with the Pico is easy but it is not simple. In fact, it's complex, but a lot of the guesswork has been taken out of the process. Instead of shopping for ingredients, you brew with pre-mixed brew packs. There are several dozen beers from which to choose in the BrewMarketplace; most are from breweries around the country and are beers you might know. If you get to the point where you'd like to create your own custom brew, there is a webpage on the PicoBrew.com site where you can create a custom brew pack with your own mix of available ingredients. Brewpacks cost about $25, and each batch brews about 10 pints of beer. You'll need to connect the Pico to your home's Wi-Fi network. You'll be able to track the brewing process online. 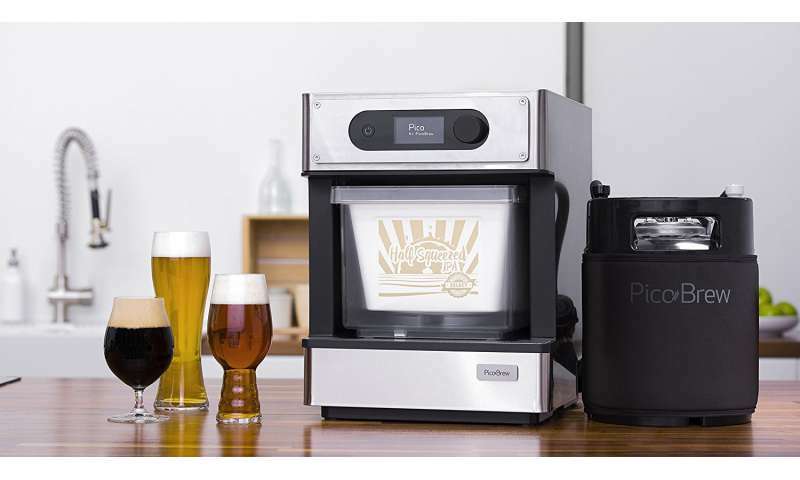 Once you unbox the Pico, there are three main parts, the main unit, which is a stainless steel box that's larger than a coffee maker but smaller than your microwave, a brewing keg and a serving keg. The brewing happens when you place the brew pack in the machine and add about a gallon and a half of distilled water. You'll attach the brewing keg to the Pico with two hoses. Use the single control knob to start the process and then wait for about two hours while the beer is brewed. Before the brewing begins, some brew packs will let you choose to tweak your beer's alcohol content and bitterness levels. It's not a quiet process and it does make your house smell like someone is boiling beer in your kitchen. Once the brew cycle is complete, you'll be left with a brewing keg of very hot unfermented brew called wort. You'll set the hot keg aside for 24 hours to get to room temperature and then add the yeast and give the keg a shake and set it aside for another three days. My batch (Half Squeezed IPA) has a hops packet that goes in the keg on the fourth day of fermentation and sits for another three days before you put the keg into the refrigerator to crash the yeast. On the eighth day, I was ready to rack the beer, which is moving it from the brewing keg to the serving keg. For racking, you'll use the Pico to pump the beer between the kegs. Once the beer is in the serving keg, you introduce carbonation, either through a natural process using sugar, or through forced carbonation using a carbon dioxide cartridge for 36 hours. I opted for the forced carbonation method, which is faster. After the 36-hour carbonation, which takes place in your refrigerator, the beer was ready to drink. Overall, I'd call my first and only brew process a complete success. The beer was delicious and smooth with a nice full head and clear golden color. If I was served my beer in a bar, I'd have been completely happy with it. The Pico is not hard to use, but there are a lot of steps to the brewing process. Each time you brew, you'll be cleaning the machine and the kegs and other equipment before and after the brewing cycle. This cleaning isn't difficult but it is a little time consuming. You will want to invest in a second brewing keg or two if you'd like to make beer more often than every 10 days or so. The serving keg provided does the job, but the vent and spout are plastic and they don't feel like they'd last through moderate or heavy use. The vent on the top of the brewing keg must be opened and closed whenever you pour a beer, and the plastic valve looks like it'll snap off once you use it a few dozen times. I'd be looking for a better serving method - perhaps a kegerator or bottling the beer. The Pico machine can also be used to cook food using the sous vide method, which involves cooking vacuum-sealed food in a hot water bath at a very controlled temperature for a long time. You won't get into brewing your own beer with a Pico to save money. The beer I brewed cost about $3 per pint, so it's cheaper than drinking at a bar but more expensive than buying beer at the store. You can brew lots of beers from smaller breweries and from what I read, the taste is really close to what you'd get at the brewery. The Pico isn't cheap, but it does make the brewing process about as foolproof as possible - I did it, and you can, too. Bottom Line: If brewing beer is something you'd like to try, this is a pretty easy way to make some great tasting beer. $3/pint??? You forgot to add the $799 for the machine! That's a lot of beer! I made my own beer with a kit that cost a mere $50, and is just as "complicated" as this machine.